Dec. 9, 2017 was a day that many will remember for years to come across South Louisiana. A blanket of snow covered many areas of the state and kept lots of folks snuggled up to a warm fire, marveling at the winter wonderland that happens in the Deep South only so often. Fishing charters were cancelled, and most fishermen with any common sense left their boats tied to the dock or on the trailer. Few, if any opted to fight the wind, ice and extremely low water. Surely no fish could be caught in these miserable conditions. Well, nobody told that to the dozens of crazy kayakers that descended on Cocodrie to participate in the Bayou Coast Kayak Fishing Club’s 2017 Championship tournament. New for 2017, the club reformatted its annual tournament series to provide qualifying events for the opportunity to participate in a shotgun start, cash payout, championship event. Four qualifying events were held during the year at various locations using different formats. 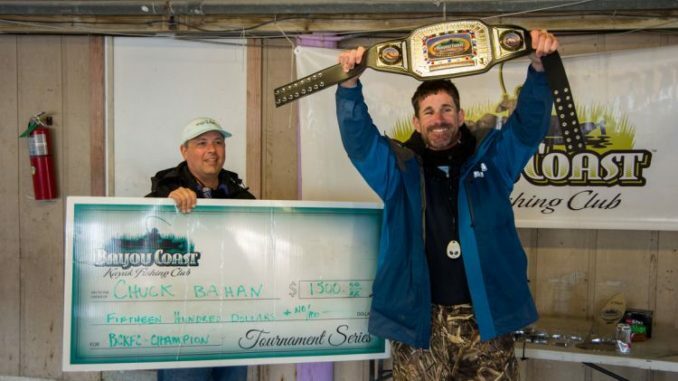 Participants that fished a minimum of two of the qualifiers and placed in the Top 15 in at least one event qualified to fish in the championship. Thirty-eight anglers were invited to participate. 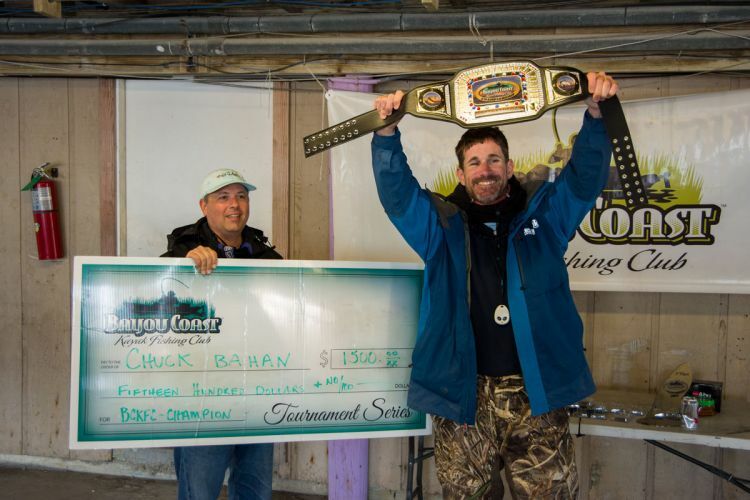 The format for the championship was entry of a combined stringer of up to two slot redfish and five speckled trout. 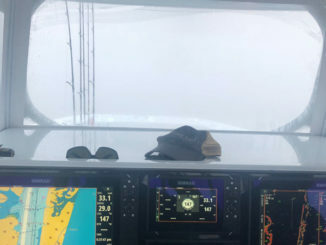 In true kayak tournament fashion, the weather went from bad to worse in the days leading up to the event. Jackson Kayak team member Chuck Bahan pre-fished the area extensively in the weeks leading up to the tournament. 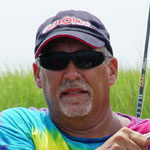 “I was able to make three trips down to Cocodrie before the tournament and patterned the reds well. I also located some decent trout. 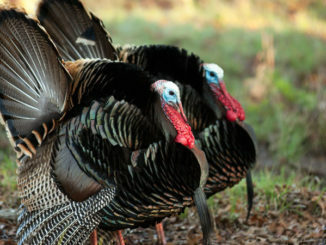 However, when I saw the weather on Friday, I knew all my scouting was for naught,” he said. Day 2 saw little improvement in conditions. Launch time at 6 a.m. was not mandatory, but leaving later meant less time for fishing to make it back for the 2 p.m. weigh-in deadline. 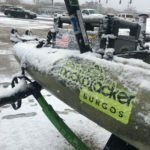 “Saturday I woke up to thick ice all over my Yukon and kayak. 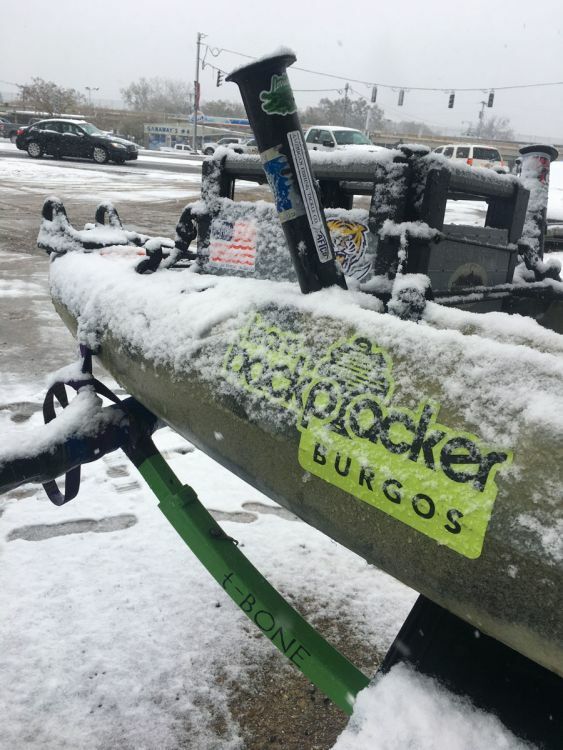 I looked at my fishing partner Lance Burgos and said, ‘We are crazy fishing in this.’ We put on so many layers that when we left the launch we started sweating. It was 11 a.m. before Bahan saw his first redfish. However, it simply wouldn’t eat. He said the whole idea of extensive pre-fishing was to devise plans B, C and D if needed. Clearly, this would be a day to run through the alphabet. He saw reds for about an hour, but just could not get them interested. He decided to wait them out in hopes that a rise in the water temperature would get them a bit more active. “I realized that the noisier baits like a spoon were just spooking them, so I switched to a paddle tail swimbait on a light jighead,” he said. Knowing that water temperature was a key to feeding, Bahan moved a bit to get to areas between little canals and duck ponds to find warmer water. “I waited them out and found water in the low 50s. I caught about eight in the next hour, with one that later weighed in at 6.34 pounds,” he said. Persistence and precision casting paid off. “You had to put it in their face and still, the ratio of casts to bites was extremely high. It was super tough to get them to eat. Time was not on my side and the clock was approaching noon, so the pressure was on. I had seen several big fish, but no takers. That would change in a hurry. My next fish was big and I thought to myself it was a small bull, but I pitched to it anyway and she ate it immediately. 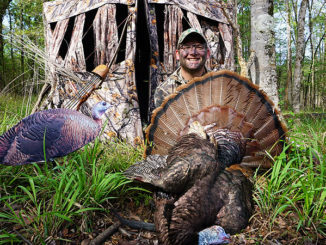 Once I netted her I thought she was over (size), but pinching the tail she was right under 27 inches — and fat,” he added. The fish weighed in at 8.48 pounds and was the heaviest red caught in the tournament. Not a single trout was entered at the weigh-in, but Bahan was impressed with the number of redfish caught. 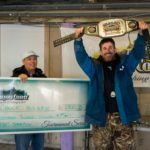 “It’s a testament to the quality of anglers that participated in this series and championship to see the number of fish weighed in. Fishing from a kayak can often be an advantage, but certainly not this day. It was the worst of conditions, and these guys proved that they have fishing skills,” he said. Bahan’s two-redfish total of 14.82 pounds earned him first place and a $1,500 check. He also took home the club’s new championship belt that he must show off at all club tournaments in 2018. The belt will be awarded to next year’s champion.